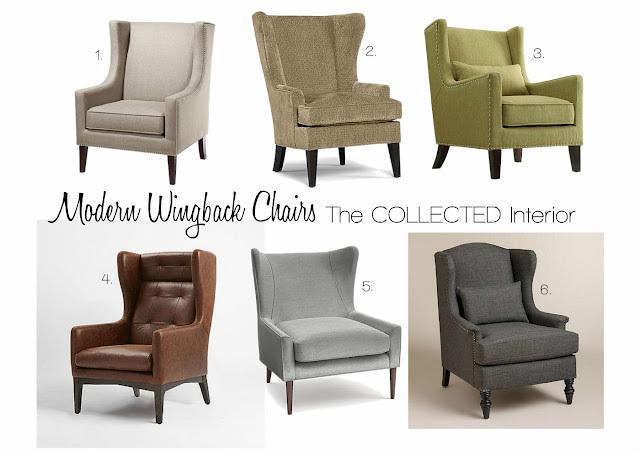 The Collected Interior: Design Crush - Modern Wingback Chairs! Design Crush - Modern Wingback Chairs! Hey guys, today I'm featuring a round up of one of my favorite furniture pieces - Modern Wingback Chairs! Wow, I had to do a double take on a few of these because they are crazy affordable! Like the Jeanette wingback from Wayfair priced at under $400. That is an unbelievable price considering this chair comes in 6 color choices and has great reviews. And the leather arm chair from West Elm is a favorite of mine - such a classic with it's tobacco colored leather. But check out the Dayton chair from Pottery Barn. It's new to their collection and priced under $600, is a great value!